SMART Roofing, Inc. is a full service roofing contractor serving Chicago and its surrounding suburbs. 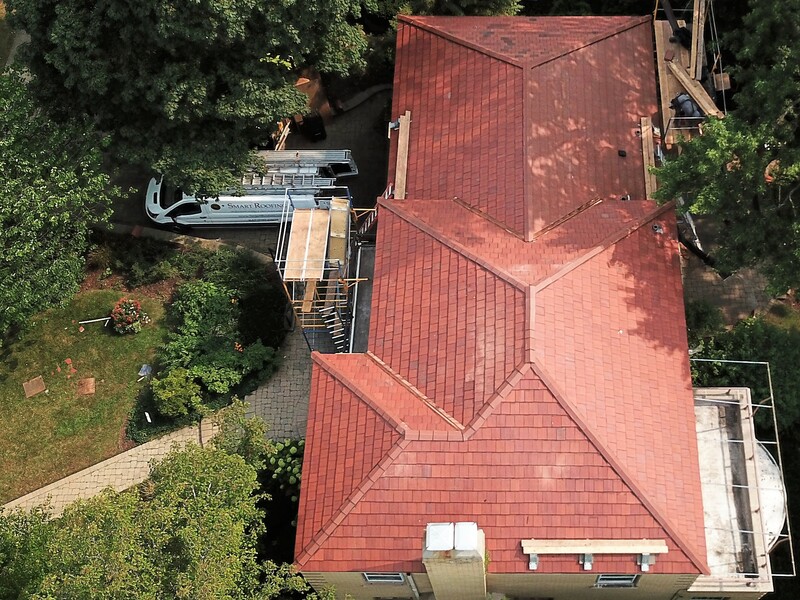 From roof assessments and repairs to installations of virtually every type of new residential roof and commercial roof, our commitment to excellence, stellar customer service and exceptional results are the "SMART" roofing difference. We provide unbiased and customized solutions based on your specific needs along with years of experience in every possible roofing and sheet metal situation. If you need a roof replacement, we can provide you with the right reasons for each roof type and which solution is best for you. Hail damage, storm roof damage - please contact us. How to Detect Roof Hail Damage? How long will it take for you to complete work on my roof? Can you just cover-over my existing shingles instead of tearing them off? What do you do about roof flashings? What should I do with my gutters? What is Ice and Water Shield and Do you install it? What do you do about skylights? Do you clean-up around our home once you've finished? Do you carry workers' compensation insurance or liability insurance? Are you an experienced contractor? How can I find a contractor that I can Trust? For residential roofs, typically, one or two days (of course, if your roof is very large - or if substantial repairs are required - it could take a bit longer). The weather can also delay the process, but we will always ensure the roof is water tight from beginning to end. Sometimes we can, depending on your roof and what's up there. Most re-roofs should be evaluated on a case by case basis. Generally speaking, tearing off existing materials, inspecting the decking (as well as the general integrity of your roof structure) and then installing your new roof will guarantee optimum long-term performance. Typically, the removal and replacement of gutters will allow the installation of ice and water shield onto fascia boards which would seal the outside edge from water infiltration in ice damming conditions. We can replace gutters with or without a new roof. We install copper, galvanized steel and aluminum gutters. Our roofing professionals will be able to determine this for you, and explain the benefits of replacing your roof and gutters together. Ice and Water Shield is a protective underlayment that is put on over the wood deck prior to any shingles. Ice and Water Shield helps prevent water infiltration during ice damming situations. We typically install Ice and Water Shield along the eaves, around chimneys, skylights and in all valleys. We'll rake and sweep all debris from the roof and around the house (sidewalks, driveways, etc.). Then we'll use nail magnets to find and pick up nails. We will perform a final inspection of your new roof and your grounds to assure your complete satisfaction. We are fully insured for both workers' comp and general liability coverage. What this means to you is that you will never be responsible for any of these expenses. We will provide certificates of insurance upon request. SMART Roofing has completed over 10,000 projects in it history. We are happy to provide you with a list of references that will confirm that we do our work as promised. We stand by our work, and will provide knowledgeable, honest answers to your questions. Has a proven track record (check references, talk to your local building department, look at work they've done in your area). Is stable (How long have they been in business? Who owns the company? If you have an old phone book, check if they were in it). Provides expertise (Are installers experienced? Does the contractor provide training and oversight of work? Has the contractor achieved certifications from manufacturers?). Provides an understandable contract (Don't sign something you can't understand. Make sure you understand what you are getting, what it will cost and when payments are due). Hail damage leads to expensive insurance claims. Hail accounts for more than $1.6 billion in damage per year, just in roof damage in the United States, according to the Federal Alliance of Safe Homes. When a storm hits your area, it may be difficult to see if the shingles on your roof have been damaged. However, there are some ways to determine if any damage has occurred. Look at the drain downspouts around your house. If you see a high concentration of black mineral deposits around the downspouts, this may be a sign of damage to your roof. Check your gutters. If the metal gutters have dents or dings from the hail, there is a good chance that your shingles were damaged as well. Climb on the roof and check the shingles. The signs can be as subtle as a small dimple in a few shingles. If you suspect damage, consider calling a specialist to thoroughly inspect the shingles for you.